Play, relax, and dine in this beautiful 3-bedroom cabin with gorgeous natural wood interiors, impressive window features, and stylish-but-cozy furnishings. Surrounded by lush mountain forestry, take the charming stone and wood bridge walkway to A Dream to Night to discover your dream Smoky Mountain hideaway in the mountains, boasting fun amenities, peaceful rejuvenation, and a convenient drive to downtown Gatlinburg. Unwind on the back deck while swaying in the bench swing, lounging in the chairs looking out to serene wooded views, and soothing a tired mind and body in the bubbling waters of the sunken outdoor hot tub. Dine in the fresh mountain air and soft sunshine drifting through the forests while seated around the outdoor table, enjoying burgers fresh off the charcoal grill. Sip on warm cups of coffee from the kitchen with the serenading sounds of the forest floating on the crisp morning air to start your day. King and queen beds await for peaceful nights, the fully loaded kitchen has plenty of dishes and cookware for in-cabin meals – enjoyed at the breakfast bar or dining table – and conveniences like high-speed wireless internet and a washer/dryer make stays easier and more comfortable after days exploring the Great Smoky Mountains National Park. 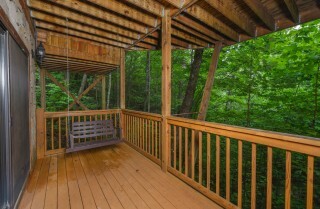 Stay connected to the beauty of nature throughout this lovely 3-bedroom cabin for an incredibly relaxing retreat in the inspiring Great Smoky Mountains in between fishing, whitewater rafting, enjoying rich culture in Gatlinburg, and exploring the hundreds of area attractions. 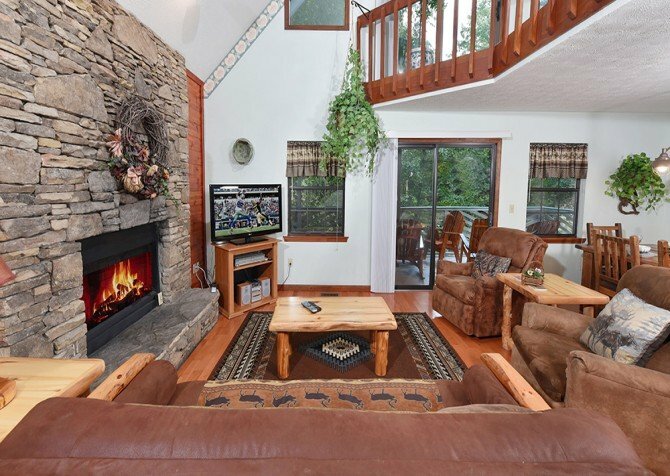 Sink into plush sofas and recliners and revel in the sublime cabin atmosphere of this beautiful open living room area. An impressive stone fireplace rises to the vaulted ceilings, offering a natural contrast to the all-wood interiors illuminated by sunlight pouring in through large glass windows that bring the beauty of nature inside. Gather around the wood coffee table for a night of board games from home or drinks with friends in the evening by a warm fire in the electric fireplace. Pull the lever on the recliner and lean all the way back while squeezing in an afternoon nap or watching a little TV on the large flatscreen above the mantel. Finish a few chapters of your current reading obsession or read a book to the little ones while sitting in the artisan-crafted rocking chair. Cooking is fun in this alluring kitchen with wood from floor to ceiling and pale natural tones balanced by cool shades of the stone tile countertops illuminated by the modern pendant lighting and sleek black appliances. Prepare meals with ease in the U-shaped kitchen, with plenty of appliances, tools, pots, or pans within reach. The 3-stool breakfast bar is perfect for a quick bite before heading out the door and buffet-style self-serve meals. With the open concept of the common spaces, guests will never miss a moment while hanging out, preparing meals, watching the big game on the living room flatscreen, and refilling drinks and going back for seconds during dinner. 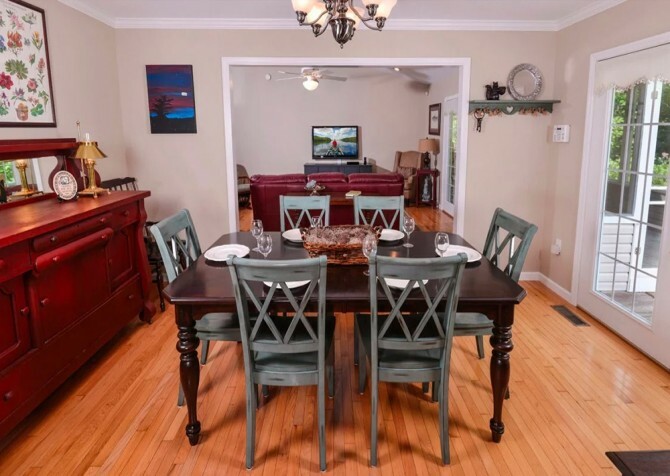 Flanked by the open-concept living room and dining room and large sliding glass doors, this dining room offers the warmth of a cabin mixed with modern décor to provide an elegant dining atmosphere and ample elbow room while laughing and cutting up with friends and family. Gather under the warm light of the charming metal chandelier for card games after a filling dinner. In the mornings, dig into a hearty pancake breakfast in the natural glow pouring in through the large windows before setting off to downtown Gatlinburg. With nowhere else to be and no stresses of home interrupting, spend hours around the table for as many meals, even if it is simply takeout, to make some of your most cherished vacation memories. With so much to do in Anakeesta, Ober Gatlinburg, and along the downtown Parkway, rejuvenating sleep is important and easy to find in A Dream to Night’s homey bedrooms. 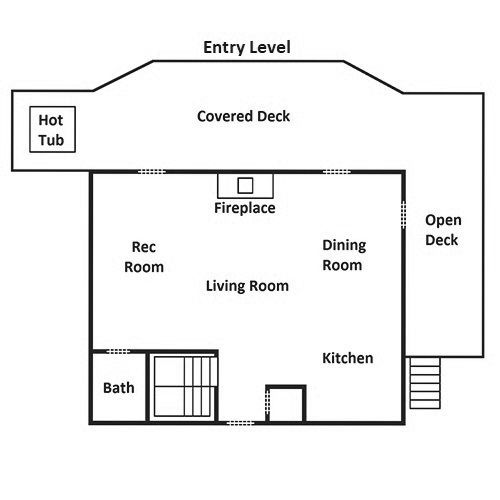 On the lower level, the kids are never too far away from you with all 3 bedrooms along one shared hallway. Here you’ll also find the laundry room and closets in each room to store clean clothes. In the master suite, crawl under the covers of the king-size bed while enjoying some late-night TV on the flatscreen after a soothing bath in the en-suite’s jetted tub. Adults will love their bedrooms’ direct access to the deck and hanging bench swing through the large sliding glass doors looking out to shaded wooded views. In second bedroom housing the queen-size bed, guests can kick back with some TV while resting under the lovely rustic chandelier before closing the curtains and enjoying an afternoon nap. Through the shared second bathroom, the kids will love having their own sleepovers in their shared bedroom with 2 twin-size beds. Back in the open-concept entry level, enjoy an evening of cold beers and billiards in your own private pool hall. The attractive pool table lit by a dual pendant light fixture adds an elegant touch to the room while providing a source of easy entertainment. 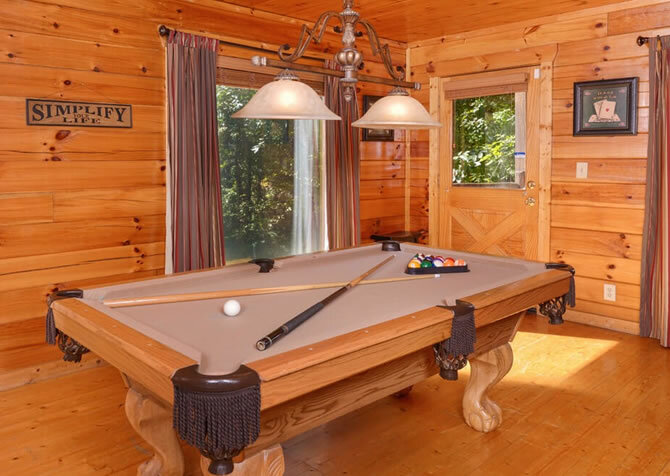 Enjoy playing a few rounds of pool while teammates wait their turns on the bench and your favorite teams play on the nearby flatscreen TV above the stone hearth. Savor every moment of your time in the Great Smoky Mountains with the exquisite outdoor spaces provided by A Dream to Night. Host a barbeque at the 4-chair iron table with freshly grilled steaks and veggies, hot off the charcoal grill before soaking up some sunlight in the deck chairs. Sip on warm cups of coffee and hot cocoa with the kids while taking in the beautiful forest views and bird watching from the deck in the mornings. Begin and end each exciting day in Gatlinburg with relaxing soaks in the sunken outdoor hot tub. 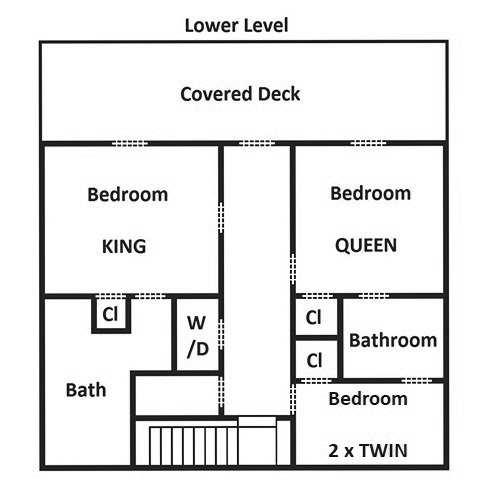 A little rain doesn’t damper your outdoor fun, as the roof stretches out over the majority of the back and lower decks. Over 30 interactive exhibits, over 10,000 exotic sea creatures, and over 350 different species make Ripley’s Aquarium of the Smokies an over-the-top adventure while vacationing in the Great Smoky Mountains! Producing some of the smoothest, award-winning moonshine and whiskey in the South, the Sugarlands Distillery is fantastic experience of an age-old tradition offering free tours of the still house 365 days a year, samples of unique, flavorful spirits paired with tasting notes and cocktail ideas along with seasonal fun events! Experience the incredible heights and sights from the top of Crockett Mountain, 1,800 feet above the city, with a scenic chair lift ride to the summit before enjoying dreamy views of Gatlinburg as you make your slow decent. "Our experience with Cabins for You was awesome! We had a beautiful, clean cabin and the whole process from reservations to checking in and out was super easy." 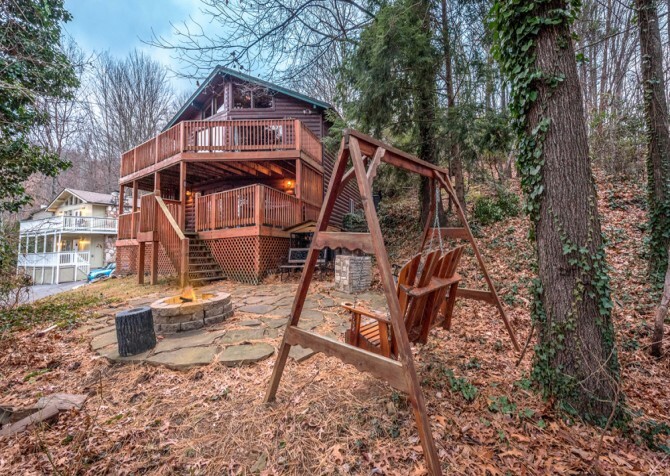 "A Dream To Night is a beautiful cabin located about 20 minutes from downtown Gatlinburg, and is part of the "Cabins For You" rental group. The hot tub was a very nice addition to the balcony overlooking the trees. We stayed at the cabin during much of the trip and cooked in for many of our meals. Great kitchen with pots and pans, dishes, cooking utensils, bakeware, and even wine glasses and a wine fridge! I loved the rustic decor inside. Well decorated and clean. Everything was in great working order! Very comfortable recliners in the living room. Internet was a little slow but given the secluded location, it worked better than I had expected! I highly recommend booking the cabin and would most definitely consider it when I come to Gatlinburg again!! We are already looking to make another trip in February and I can't think of another place I would rather stay! Thank you so much!!" "The reviews seem mixed depending on which cabin you choose. We went with A Dream to Night based on another review and it was great. The 2 story deck extends the entire back of the cabin and offered scenic views of the area...there wasn't a cabin behind us for miles. We used the grill to cook out one night and the kitchen had everything we needed. Pool table and hot tub were a plus. Definitely would book again." "My fiance and two of my best friends stayed in "A Dream to Night" and it was definitely a dream! The pictures online were nothing compared to how breath taking it was as soon as you walked in!! Check in was so easy, everything was clean and it had everything we needed for food plus more! I loved the pool table and the jetted tub! The hot tub worked perfectly and was super warm! Our cabin was next to another one but it was so quite and private you couldn't tell! We spent majority of the time at the cabin cooking and hanging out! The cabin was clean and spacious. The only thing I regret is not staying longer! Will definitely book with y'all again, thank you!!!"